Nainital is a stunning hill station in Uttarakhand. Amidst the splendid peaks and gorgeous views, the town mesmerises the hearts of visitors. Whether you talk about historic spots, beautiful natural destinations or spiritual places, the town has everything stored for you. The best part of this town is that you can visit here in any season because the panoramic views are going to be right there. No matter how crowded the town has become today, it hasn’t lost its glorious charisma. Tourists visit this hill station throughout the year so as to steal some splendour and glee. If you have a plant to visit this town, just book a resort in Nainital for your stay and carry out a majestic tour in the town. Tiffin top is also popularly called as Dorothy Seat. It is a stone work perch on this spot of Tiffin Top. It was constructed in the memory of painter Dorothy Kellet. The views of this spot cater breath-taking sites of both the Himalayas and Nainital town. It caters superb views of its surroundings. It is gorgeously perched at a height of 2290 meters and has been cherished as a very popular picnic spot. Not just the couples but also friends and family visit the spot for spending some refreshing moments. Actually, the Dorothy’s Seat is a stonework picnic post on Tiffin Top constructed as a memorial to the wife of a British Army officer. In case you are going to this spot, you must take some spare hours with you to cherish the beautiful panoramas and capture them in your cameras. Naina Devi temple lies on the banks of gorgeous Naini Lake, and it is a very popular place to witness in Nainital. It has strongly been believed that the eyes of Goddess Sati fell at this exact same spot where this temple stands. It entices a huge number of devotees. This temple is located at the top of Naina Hill. It is believed to be constructed in the fifteenth century A. D. it was reconstructed in the year 1883. After entering the temple, on its right, there are beautiful idols of Lord Ganesha and Lord Hanumana. In the temple, there are three divinitiesMaaNaina Devi, Mata Kali Devi and Lord Ganesha. 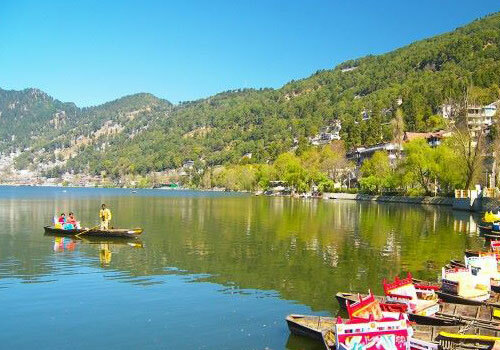 NainiLake is one of the most cherished and popular tourist magnetisms in Nainital. It is the heart of this beautiful town. The lake replicates the shades of stunning surroundings the lake is in the shape of pear and entices a lot of tourists who visit here and relish yachting, boating or paddling in the lake. The visitors can explore this lake from one end to other seeing energetic and tranquil views of the sunset. This lake is enclosed by seven green hills and snips the attention of many. Thus, what keeps you away from Nainital when you can reserve your rooms in the reasonable good hotels in Nainital? Just go ahead and enjoy the exquisite spots of this town. Nainital not just cater you these three gem spots but there is variety of other destinations too.